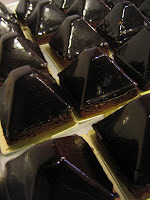 Charmaine's Pastry Blog: Pyramid construction? 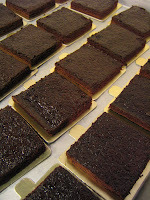 Today, I assembled the Poire et Sichuan Chocolat small entremets. I had prepared the maple pear jelly inserts and szechuan pepper dark chocolate mousse in Flexipan pyramid molds earlier this week. They are frozen before being unmolded and glazed with a shiny chocolate glaze. 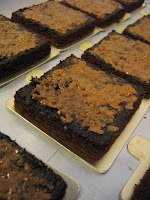 A square of very moist chocolate cake is lightly soaked in simple syrup and then a thin layer of praline crunch is spread. Then the mousse pyramid is laid on top (carefully!). Before display, a little chocolate shave is added at the apex like a mohawk hairdo. The world of Flexipan is novel for me because we had limited exposure or use for them during school. The multitude of shapes and sizes makes the possibilities endless, especially in the large-scale creation of entremets and inserts. Now I wish I could purchase many of them but they are not cheap and they seem to only come in large quantities. Perhaps they are less expensive in France? I can just see my suitcase full of pastry equipment and supplies after our trip in April! Posted by Charmaine at 7:58 p.m.